When testing a new sat nav, there are two ways to kick things off. The first is to pore through the instructions and meticulously follow the manufacturer's step by step set-up procedures to the letter. The other route is to get it out, use your instincts and begin operating it immediately. I chose the latter and while it's easy to see it as a lazy choice, I find it's also the option that can quickly highlight a product's strengths or weaknesses. The product in question is the Garmin DriveLuxe 51 LMT-D and to be frank, things didn’t get off to the best of starts. Setting off from my North London home, I needed to get to Millbrook Proving Ground in Bedfordshire for a driving day, but the device wasn’t recognising the postcode, nor the venue itself as a place of interest. As time was pressing, after a frustrating couple of minutes I abandoned the exercise and switched to the Waze app on my iPhone – which recognised the location immediately as I began to type. While it would be easy at this point to simply dismiss the Garmin as ineffective, I thought it important to give it another chance since the Millbrook venue has historically been a bit of a tricky one for sat navs. To say I’m pleased I did is something of an understatement, as the Garmin hasn’t put a foot wrong since – delivering me seamlessly to a range of subsequent postcodes and address locations. The Live Services have helped me out with alternative routes that dodged the traffic jams and saved my bacon on a number of occasions. I never needed the live on-street parking information, but it’s a really cool feature that displays pricing and availability trends for on-street public parking as you approach your destination. Hooking up my iPhone via Bluetooth, I was able to make hands-free calls and see incoming calls, texts and calendar reminders on-screen, without ever being tempted into the dangerous distraction of reaching for my handset – and risking a £200 fine and 6 penalty points! The DriveLuxe 51 LMT-D comes preloaded with lifetime European maps (45 countries) and safety camera updates and even has built-in Wi-Fi to make it easy to keep your software bang up to date. The device itself feels weighty in your hand, in a way that conveys robust, high quality construction. Its sleek, contemporary metal casing clamps securely onto the supplied magnetic mount which in turn fixes very easily onto your windscreen. Initial hiccups aside, I’d have no hesitation in recommending the DriveLuxe 51 LMT-D if you’re looking for a separate device that keeps your phone free to be a phone. It’s not among the cheapest but it does come stacked with clever features. 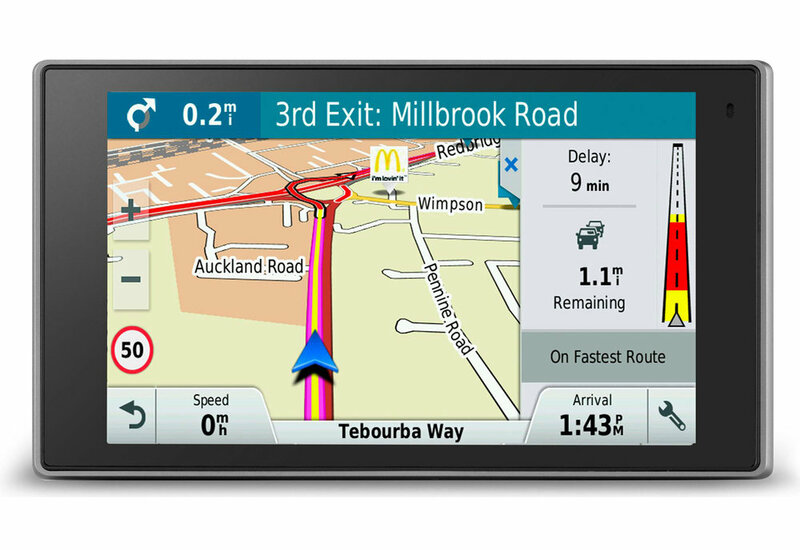 Retailing at £319.99, it’s one of a range of Garmin sat navs available at Halfords who kindly supplied the unit for review – as well as another Garmin device for our competition/giveaway.